Accessible only by sea or air, Alaska's 'Gateway to the Glaciers' is the state's scenic capital, situated among spectacular mountains on the shores of the Gastineau Channel. 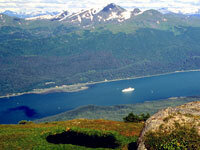 The holiday destination of Juneau is, however, not as wild as one might expect of such a remote destination. It affords all the pleasures of a large city, while also offering an abundance of activities and natural escapes for outdoor enthusiasts in its backyard. Although the city is not without appeal and is a popular travel hub and port of call for cruises, it is undoubtedly the natural setting that attracts tourists rather than the urban sightseeing opportunities. In 1880 the city swarmed with gold prospectors, but today it is the cruise ship passengers who pack the streets every summer, enjoying the shopping, dining and picturesque surroundings. Mendenhall Glacier, Alaska's most visited glacier due to its easy access and proximity to the city, is a highly worthwhile attraction. Glacier Bay National Park is one of the country's more dramatic regions and is also accessible from Juneau, by boat or plane. Helicopter rides, fishing, whale-watching, hiking and kayaking are popular activities through which to fully appreciate the vast wilderness surrounding Juneau. We are looking for contributors for our Juneau travel guide. If you are a local, a regular traveller to Juneau or a travel professional with time to contribute and answer occasional forum questions, please contact us.